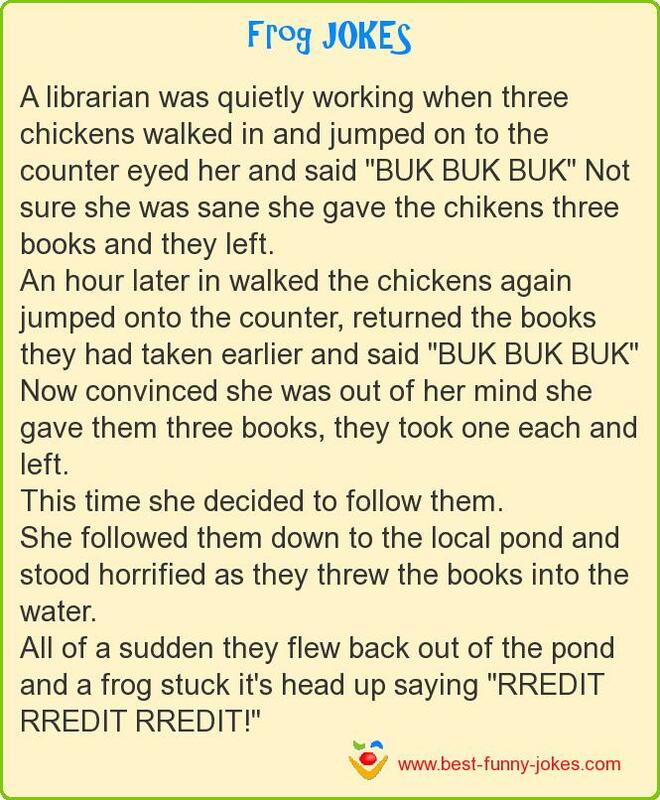 A librarian was quietly working when three chickens walked in and jumped on to the counter eyed her and said "BUK BUK BUK" Not sure she was sane she gave the chikens three books and they left. An hour later in walked the chickens again jumped onto the counter, returned the books they had taken earlier and said "BUK BUK BUK" Now convinced she was out of her mind she gave them three books, they took one each and left. This time she decided to follow them. She followed them down to the local pond and stood horrified as they threw the books into the water. All of a sudden they flew back out of the pond and a frog stuck it's head up saying "RREDIT RREDIT RREDIT!"